Just getting to the River View Guest House is an experience all its own. Winding through the back alleys of the Talad Noi part of Chinatown, you’ll roll past stalls of engine parts sellers and street food vendors until you find the signs pointing to the hotel/hostel. 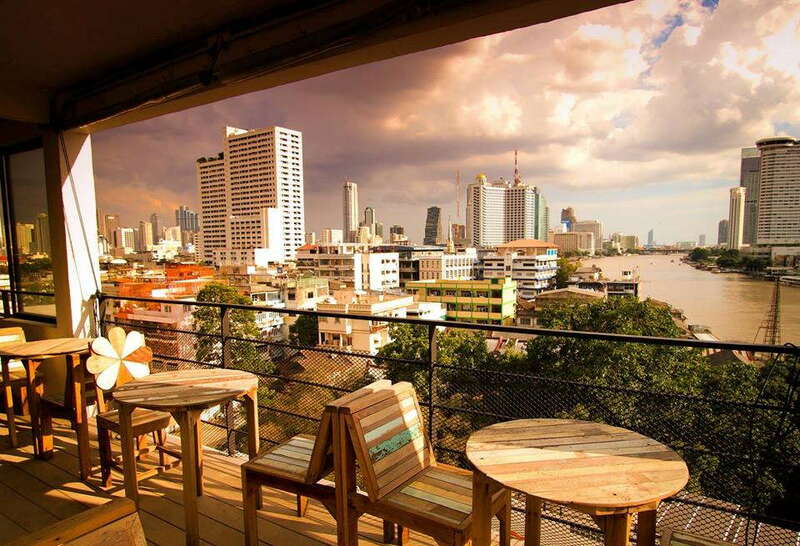 Situated next to the river, the three-story property welcomes budget-conscious guests and backpackers with an array of accommodation options, a rooftop restaurant and bar, and a window into Bangkok’s Chinese history, present, and future. YOU SHOULD KNOW When it’s hot (always) there isn’t any air conditioning in the common areas. Also, only the nicer rooms of the hotel have air con, so be aware of that with the less expensive alternatives. 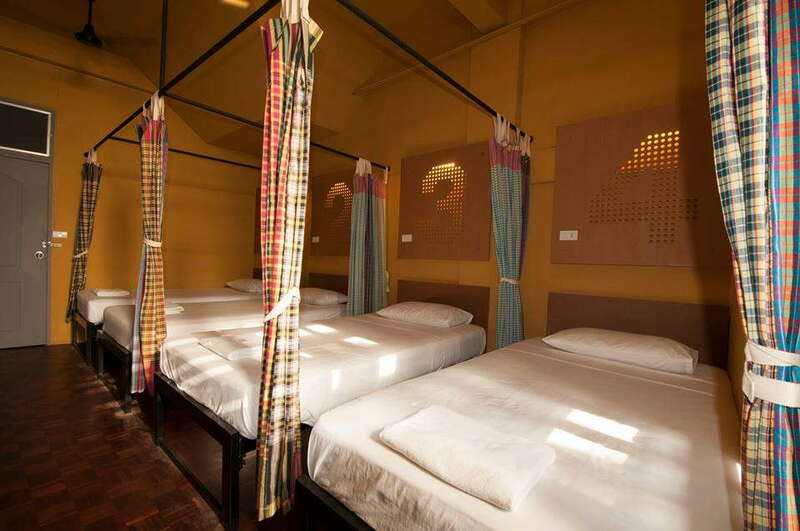 Depending on your budget, some rooms come with bathrooms and others are shared. The nicest rooms feature balconies with river views and ensuite showers and toilets. There are also dorm options with rooms separated by gender but you’ll be sharing a bathroom with strangers. 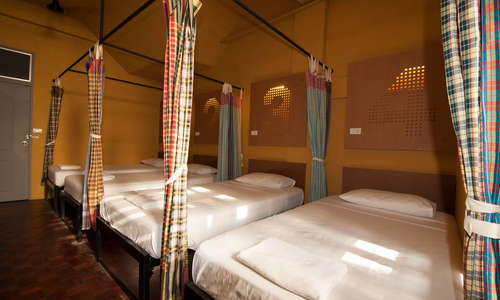 The cheapest options come in around $10 a night, while the nicest rooms can run as high as $50. If you book two weeks in advance you can get 15% off rooms with A/C and a free welcome drink with a minimum three-night stay. If you do get your own bathroom, you’ll find them generally cramped without a lot of separation between the showers and toilets. An ultra-hot lobby has a few chairs and a mega-fan blowing at the front desk to help cool off the staff. There is free coffee and tea here if for some reason you want a hot beverage in the sweltering heat. The hotel has free bike rentals that you can find in the lobby. The rooftop restaurant looks over the river and has colorfully cushioned banquettes and hard wooden tables and chairs. The restaurant offers a mix of Thai cuisine and international staples. YOU SHOULD KNOW During the rainy season, the restaurant isn’t always open, but you can still get drinks. The rooftop restaurant offers guests refreshing drinks and great views of the river. It’s a little tricky to get around this area. Mostly, you’ll be doing a lot of walking, but fortunately, it’s only 15-minutes away from the Hua Lamphong MRT Subway stop that can whip you around the city with ease. Getting cars through the winding alleys is a little tight, so you may find yourself hailing motor bike taxis or tuk-tuks to get you anywhere in the area. Talad Noi is an old part of Chinatown that hugs the river and is replete with winding alleys, small restaurants, street food vendors, and car engine part sellers. It’s totally safe to walk around here, but it’s dense and you’ll be hit with sights, sounds, and smells you won’t find anywhere else. 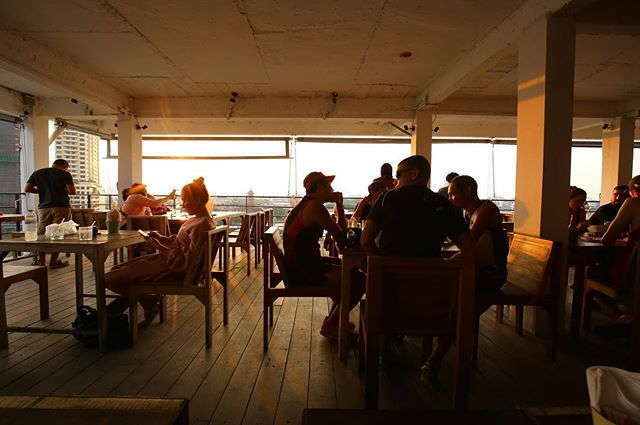 Sheepshank Public House (5-minute walk) is a modern American spot on the river and great for dinner dates. 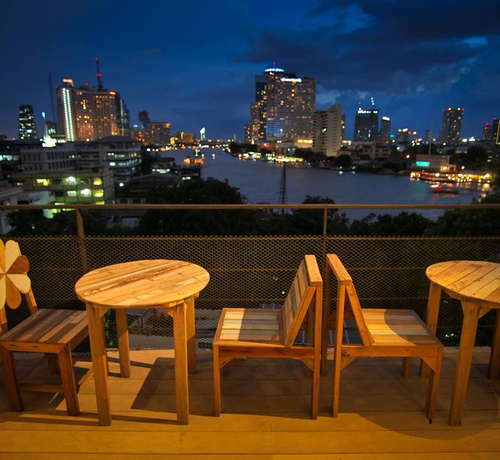 Babble and Rum (7-minute walk) serves international cuisine on the river with Thai food, burgers, and more. Slow and sultry tunes can be found at Adhere The 13th Blues Bar (5-minute walk). 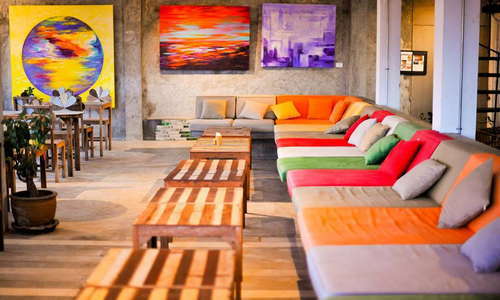 Madame Musur (8-minute walk) is a backpacker’s favorite on a backpacker-filled street. You can find cheap drinks in an open-air setting. If you want to be on the river but avoid paying riverside hotel prices, then River View Guest House might be up your alley. Speaking of alleys, you’ll find yourself in a Bangkok time warp as you cross through winding streets to find the hotel but on the way, encounter a piece of Chinatown from days past. Simple and cheap, River View gives guests a window into a side of Bangkok that you can’t find in luxury properties, and while it’s hot and rustic, the rooms are clean, the staff friendly, and the views worth more than the price of admission.